Racism and mental illness are two of the biggest issues facing our community and we need to work together to generate awareness and support to help end the stigma associated with mental illness and work to eliminate racism. The ‘Stand Up’ to Racism campaign, coordinated by Ashley Nurmela, has expanded this year to include ‘Speak Up’, coordinated by Jodi Afonso, to help generate awareness and remove the stigma associated with mental illness. In 2015, the ‘Stand Up’ initiative was started by the Native Child and Family Worker Program at Confederation College. Ashley Nurmela, the leader of this initiative advocated, organized, and held the first ‘Stand Up’ awareness initiative along with her peers. Ashley’s passion, drive, and belief to stop racism drove the successful event. The goal was to generate awareness and bring attention to what is experienced by so many individuals on a daily basis. 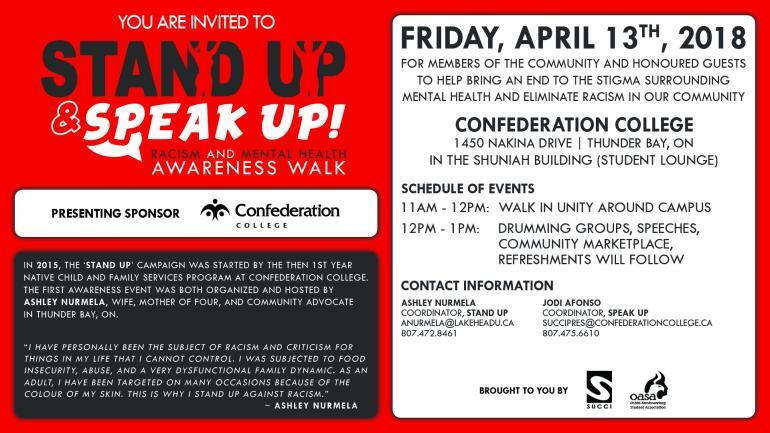 On Friday, April 13th, 2018 – students, staff, alumni, and the general public are invited to walk in unity at Confederation College for the ‘Stand Up & Speak Up – Racism and Mental Health Awareness Walk.’ The walk will take approximately 1 hour (11 AM – 12 PM) with drumming groups, speeches, and refreshments to follow. There will also be a community marketplace on-site with merchandise available to purchase in support of Stand Up & Speak Up. PREVIOUS POST Previous post: Multiple Food Recalls YOU Need To Know About!